Packed in clear plastic w/bow. Luke Adams' American-blown glass hanging ornaments, paperweights, pumpkins and Christmas trees are among The Ellen Rice Gallery's most popular gift and home decor offerings. All of Luke's blown glass, with the exception of his Snow Stars and vegetable ornaments, are tri-colored with blends of colors achieved as the glass is twisted and pulled, creating still more colors and shades of colors. Each contains a small piece (about 1") of reflective, two-colored dicroic glass in the center that changes color depending on the angle from which you're viewing it. To make ordering simple, we've stated only the predominant colors in the choices below; please keep in mind that all have three colors. plus color-changing dicroic. For instance, The colors referred to as blues will have perhaps cobalt and caribbean blues and possibly purple or violets or even golds swirling through, plus dicroic glass, but will look predominantly blue. Violets will have cobalt blues, purples, violets, reds, dicroic, but be predominantly in the purple family, and so on for the greens and pinks. Since each is individually hand blown, no two are ever alike. Each piece comes with a card about Luke and is attractively boxed. Please call the gallery at (302) 539-3405 if you need assistance with a selection and we'll be pleased to help you. We know you're going to enjoy displaying and giving the diaphanous beauty of Luke Adams' ever-evolving blown glass. Stop in the gallery or check back here often to see his latest creations! ​This 6" Star hangs perfectly in a window and its twisted legs gleam with an extra sparkle in the sunlight. Each piece has 3 distinct colors. Select the best dominant color for your piece. 5" hanging glass star or starfish ornament. Can also lie on a surface or decorate a bowl of found beach objects. Small Hearts are 3" x 2". They hang and come individually packaged. Luke's hanging glass crosses make your window a cathedral window. Add sparkle to your window with Luke's Large Twisted Cross and light refracts off the twists. 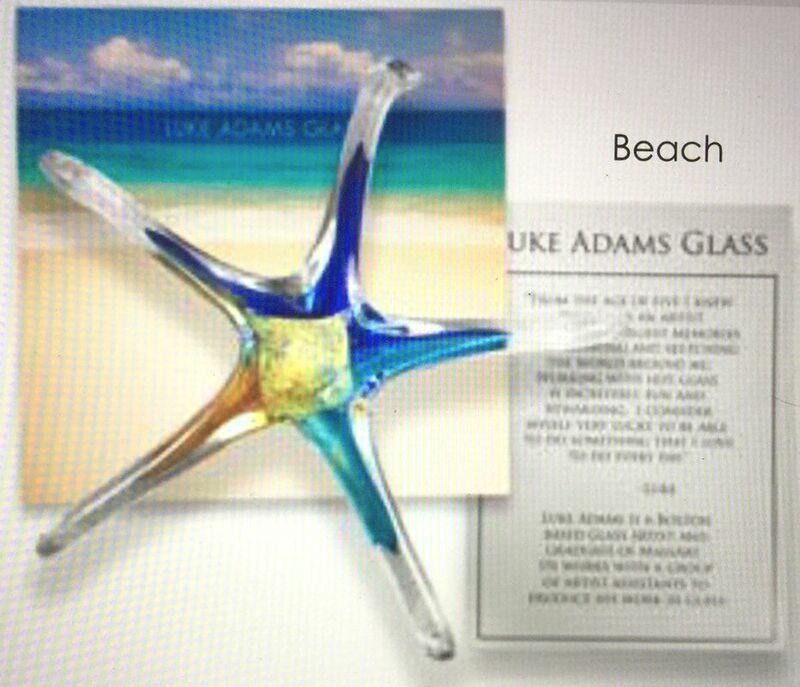 Luke Adams's childhood talent for drawing spurred him toward an education in glasswork at the Massachusetts College of Art, where he honed his technique under artists from all over the country. ​Today, Luke molds his molten medium into colorful, one-of-a-kind starfish suncatchers, jewelry, and paperweights. Through jewelry-making and glassblowing classes, his studio spreads a passion for glass-oriented artistry, teaching students to shear and assemble artful shards, molding them into versatile, translucent building blocks similar to the kind used by Gustave Eiffel to construct an ice-cube model of his famous tower.